ENVIROSEAL IS AN ECONOMICAL YET PREMIUM WATER BASED CURING AND SEALING COMPOUND CONFORMING TO ASTM C-309 AND ASTM C-1315. ULTRA LOW VOC MAKES THIS PRODUCT AVAILABLE FOR LEEDS POINT CREDITS. PRODUCT WILL PRODUCE A SHEEN AND EFFECTIVELY PREVENT EARLY EVAPORATION AND DIRT, MILDUE AND MAKES CONCRETE LAST LONGER WITHOUT CHANGING THE APPEARANCE. SUITABLE TO CURE COLORED SURFACES AND RECOMMENDED FOR ALL CONCRETE CURING. DURASEAL IS A HIGH PERFORMING WATER BASED SEALER CONFORMING TO ASTM C-1315 THAT IS SUITABLE TO SEAL PAVEMENT AND AREAS OF TIRE TRAFFIC. THIS PRODUCT PERFORMS LIKE MANY SOLVENT BASED ACRYLICS IN DURABILITY AND CHEMICAL RESISTANCE. LOW ODOR MAKES THIS PRODUCT SUITABLE TO SEAL INTERIOR AREAS AND IS RECOMMEDED TO SEAL STAMPED, STAINED AND ALL DECORATIVE CONCRETE. CRYSTAL GLOSS IS A XYLENE BASED ACRYLIC POLYMER SEALER USED IN AREAS SUCH AS DRIVEWAYS AND ANYWHERE A DURABLE CHEMICAL RESISTANT FINISH IS NEEDED. THIS PRODUCT OFFERS WET LOOK GLOSS AND HIGHER DURABILITY. CAN ALSO BE USED AS A VAPOR AND MOISTURE RESISTANT MEMBRANE UNDER FLOORING SUCH AS WOOD AND OTHER BONDED SYSTEMS. NOT SUITABLE FOR BONDING CERAMIC TILES WITH CEMENTITIOUS THINSETS. PAVER-LOK IS A SOLVENT BASED CLEAR ACRYLIC SEALER USED OVER PAVERS AND STONES TO SEAL AND PROTECT AGAINST DIRT AND CHEMICAL ATTACK, PRODUCES A GLOSSY PROTECTION FINISH AGAINST WATER DAMAGE AND FADING. IT WILL LOCK THE SAND JOINTS TO KEEP SAND IN PLACE FOR BETTER DURABILITY. USED IN COMMERCIAL AND RESIDENTIAL DRIVEWAYS, PATIOS AND POOL FLATWORK. ENHANCES THE COLOR AND APPEARANCE OF ALL PRECAST PAVERS & TILES. ​SUPER SEAL 30 IS A SOLVENT BASED CURE AND SEALING COMPOUND FORMULATED WITH HIGHER SOLIDS. USED IN WAREHOUSE FLOORS AND ANYWHERE A HIGHER SOLIDS PRODUCT IS SPECIFIED. CAN BE USED ON FORKLIFT TRAFFIC AND TO SEAL SURFACES AGAINST DIRT AND STAINS. FIRST COAT IS USED TO CURE AND TO SEAL CONSTRUCTION DIRT OUT. FINAL SEAL WILL PRODUCE AN EVEN GLOSSY PROTECTION SURFACE FOR EASE OF CLEANING AND REDUCED MAINTENANCE. ​SUPER SEAL 25 IS A SOLVENT BASED CURING AND SEALING COMPOUND SUITABLE FOR USE ON FRESHLY POURED CONCRETE. CONFORMS TO ASTM C-309 AND ASTM C-1315. 25% SOLIDS WILL PRODUCE AN EVEN GLOSS ON ALL CONCRETE SURFACES. SEAL HARD Is a Sodium Silicate solution to dust proof and harden concrete surfaces. Commonly referred to as "Liquid Glass" It is not a membrane forming sealer. 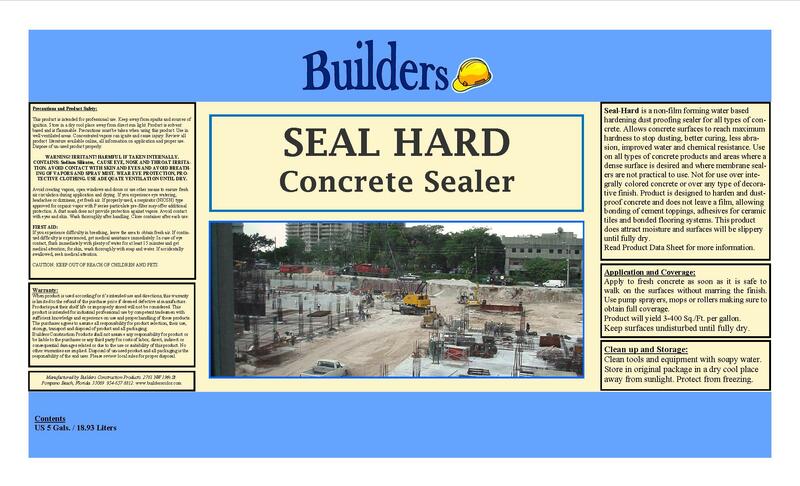 Seal surfaces and helps in the curing process by preventing rapid surface evaporation and providing a flat sealed look. Recommended on floors to receive cement coatings or thinset for placing ceramic, stone tile floors, or anywhere water curing or membrane sealers are impractical to use.